Developing the capacity of communities and organizations to tackle complex issues through collaboration and a systems approach that achieves results and community impact. Working with leadership and stakeholders in the three-county region of greater Orlando, we developed a plan to accelerate progress on ending homelessness. Working with Your Way Home, Barbara Poppe and Associates completed a research study sponsored by HealthSpark Foundation to help Your Way Home develop a comprehensive homelessness and eviction prevention strategy in Montgomery County, PA. 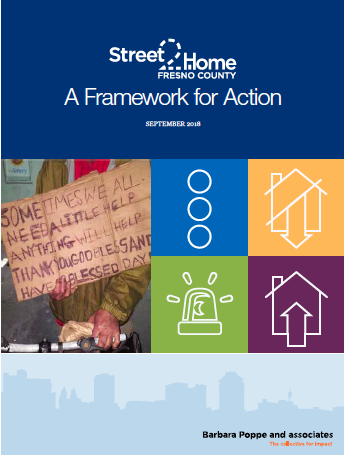 The final report, “Unlocking Doors to Homelessness Prevention: Solutions for Preventing Homelessness and Eviction.” This report includes information on our research process, the models we studied, and our implementation status. It also shares helpful tips for philanthropy, community partners, and local governments looking to adopt similar strategies in their own communities. The study has led to the launch of two pilot projects to address homelessness prevention, the Eviction Prevention and Intervention Coalition (EPIC) and the School-Based Homelessness Prevention Program. Working with the Ohio office of the Corporation for Supportive Housing, Barbara Poppe and Associates facilitated a year and half long process to create a statewide plan to end homelessness in Ohio. The phase 1 report "What will it take to end homelessness in Ohio?" was published in September 2017 with the final report to be published in early 2018. In September 2016, the City of Seattle and Barbara Poppe and Associates released a comprehensive study and recommendations to eliminate unsheltered homelessness in Seattle and set a path forward to a functional end to homelessness. This groundbreaking report Recommendations for the City of Seattle's Homeless Investment Policy: The Path Forward - Act Now, Act Strategically, and Act Decisively informs the Mayor's Pathways Home Initiative. A companion report includes recommendations on how the City can improve access to existing affordable rental housing. In October 2015, the Central Florida Commission on Homelessness and Barbara Poppe and Associates released the most comprehensive study of children and families who are without a home in the history of our region, titled The Current State of Family Homelessness in Central Florida. What strategies can increase employment of permanent supportive housing residents? CSH, in partnership with Barbara Poppe and Associates, recently published an In-House Employment Resource Toolkit for the Ohio Department of Mental Health and Addiction Services. In addition to the important introduction to the In-House Employment resource document, the toolkit includes valuable materials designed to help housing and service providers develop or enhance their in- house hiring practices. How can the state of Florida update its approach to homelessness? Florida is home to sunshine, beaches, and many other wonderful things. But the state is also home to the third largest incidence of homelessness in the United States. It is a serious problem that needs to be addressed in every community and across the state as a whole. In September 2015, the Central Florida Commission on Homelessness and Barbara Poppe and Associates released an in-depth study on the state of homelessness in Florida. The study explored causes of homelessness in Florida; highlighted communities’ responses; and identified opportunities for shifts in programs and policies that, when coupled with community engagement, can produce tangible and measurable solutions for people experiencing homelessness. How can employment be a tool to prevent and end homelessness? Barbara Poppe facilitated a national summit on integrating employment and housing. This report describes lessons learned from 11 participating communities and recommendations for federal agencies. First described in Stanford Social Innovation Review in Winter 2011, researchers John Kania & Mark Kramer described: "successful collective impact initiatives typically have five conditions that together produce true alignment and lead to powerful results: a common agenda, shared measurement systems, mutually reinforcing activities, continuous communication, and backbone support organizations"
How does participatory leadership work? It was the.summer of 2009 when Barbara Poppe got a call from the Obama administration. Housing and Urban Development Secretary Shaun Donovan needed to present a new national plan to end home-lessness to Congress by May 20, 2010, and was tapping her to head up the United States Interagency Council on Homelessness. Barbara Poppe stepped down as executive director of the US Interagency Council on Homelessness. A final blog captures some of her reflections. How can collective impact apply to ending homelessness? Many communities have developed "ten year plans to end homelessness". Using a collective impact approach increases likelihood of success. The slide deck is from a workshop at a conference where I provided an overview on the topic.